SAN FRANCISCO — The Coast Guard, National Oceanic and Atmospheric Administration (NOAA) - Monterey Bay National Marine Sanctuary, California Department of Fish and Wildlife's Office of Spill Prevention and Response (OSPR), Monterey County and Santa Cruz Fire Department continued a unified response Monday with cooperation of the vessel owner to respond to a 56-foot commercial fishing vessel that ran aground Sunday morning with a maximum potential capacity of 1,200 gallons of diesel aboard near Natural Bridges State Park in Santa Cruz. The vessel, Pacific Quest, began breaking apart on the rocks Sunday evening, causing a fuel line to rupture and discharge an estimated 200 gallons of diesel fuel, however this estimation will remain dynamic until offloading operations are completed. The fuel release was unrecoverable and there is no visible sheening. The source of the leak has been secured. The fuel tanks remained in the stern of the vessel, which washed ashore as the vessel broke apart, allowing responders to begin defueling operations Monday morning. An estimated 620 gallons were pumped into fuel totes before a tidal shift occurred and operations were suspended for safety. The removed fuel will be pumped into vacuum trucks for transit. Operations are scheduled to resume at the next low tide, approximately 5 p.m., Monday. There are currently an estimated 180 gallons of diesel fuel left aboard, 20 gallons of lube oil and multiple batteries. 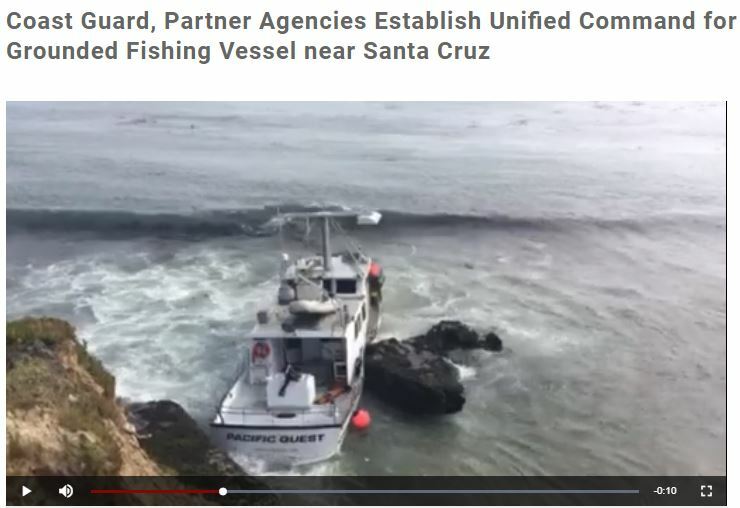 Following the pollution removal efforts, the vessel owner will continue to work with the National Oceanic and Atmospheric Administration (NOAA) - Monterey Bay National Marine Sanctuary and other involved parties to remove the vessel and any remaining debris. 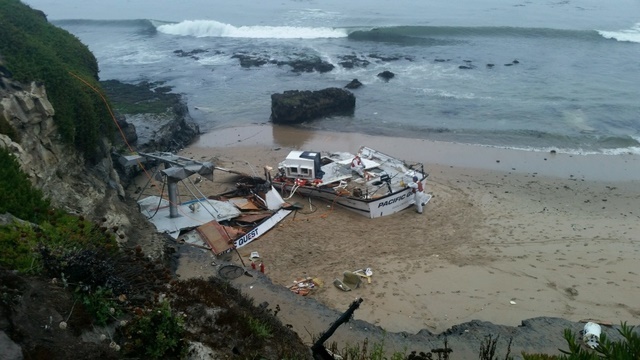 The 56-foot commercial fishing vessel, Pacific Quest, is shown broken and beached near Seymour Marine Discovery Center in Santa Cruz, Calif., Aug. 13, 2018. Responders are working to remove fuel from tanks on the beach during low tide. (U.S. Coast Guard courtesy photo/released).